He humbled himself and became obedient to the point of death— even death on a cross. Crowds welcomed Jesus into Jerusalem waving palm branches and shouting as he rode on the back of a donkey. They laid clothing and branches on the road as if rolling out the red carpet, not even letting the feet of the donkey touch the ground. The people shouted their welcome and blessing as Jesus approached Jerusalem: “Blessed is he who comes in the name of the Lord! Hosanna in the highest!” This was truly a right royal welcome. But behind this excitement, sinister events were beginning to take place. Jesus’ enemies were already plotting to bring an end to this fraud whom people had come to regard as a prophet. We are told people put their faith in Jesus, especially after he had brought Lazarus back to life again. Dark, sinister, underlying implications lay behind the ‘Hosannas’ of Palm Sunday. As we listen to the cheering crowd it’s easy to forget momentarily that something terrifying and horrifying is about to happen. An innocent man is about to be treated with so much indignity, cruelty, and torture and then be murdered. There is a lot about the Bible that is M rated. There are pages in it that are frightening. There are scenes that are left to our imagination without graphic verbal descriptions, such as the tearing of Jesus’ flesh with the scourge and the bloody mess it made of his body or a description of what happened when the nails were driven through his hands and feet. We aren’t given detailed descriptions of those hours that Jesus was on the cross and the agony he endured. There is little doubt from what we have that his death was a cruel one, but the gospel writers don’t dwell on the details. Can you imagine what today’s TV journalists would have made of such an event with a minute by minute description given by on-the-scene reporters and interviews with Mary, soldiers, religious leaders and so on? But there are other times when the Bible doesn’t spare us the shock. For example, when God asked Abraham to kill and sacrifice his only son. We couldn't think of anything more horrifying than to kill any child, let alone the one and only son who was the joy of this old man and his wife. And now as we enter Holy Week we are reminded of another father who was prepared to allow his only son to die a cruel and senseless death, a death on a cross. The sacrifice of the innocent is simply too horrible to contemplate. A preacher made a list of what she considered to be terrifying texts in the Bible. She called them the “Texts of Terror”. On this list is the flood sent to wipe out every living thing except Noah and his family and the animals on the ark. There is the killing of the first-born son of the Egyptians when Moses led the people out of Egypt (Exodus 11:5). Then there is the destruction of cities like Jericho and everything and everyone in it (Joshua 6) and the punishment of whole families for the wrong-doing of one individual (Joshua 7). We can rationalise and give explanations, but that doesn’t take away the terror and harshness of these events. how those who fail to give a drink to the thirsty, visit the sick and imprisoned, give clothing to the naked, and welcome the stranger are “sent away to eternal punishment” (Matt 25:41-46). Texts such these expose our vulnerability. They remind us that sin has a powerful effect in our lives and that God's attitude to sin hasn’t changed one bit since the days of Noah, or the people of Jericho. Jesus calls us to be his disciples but warns us that discipleship is demanding and we will fail often. or about finding ourselves on the wrong side of the door when the end of time comes and hearing the muffled sentence from the other side of the door, “Truly, I tell you, I do not know you”. Taken by themselves these texts are enough to make us get up, walk away and give up. As hard as some of this is we need to hear these verses, not to frighten the socks off us, but to remind us of how helpless we are, how much we need God's grace and love and peace. We can’t seem to help ourselves and we continually fail to follow Christ and let his love and grace flow through us into the lives of the people around us. We don’t mean to do it but we offend the Holy Spirit when we ignore his guiding and direction and choose the way of selfishness and self-centredness and make choices that give little consideration to anyone but ourselves. As much as we like to think we are winning the war over life destroying illnesses and so delaying death, in the end we are not so ‘in-charge’ as we would like think we are. We need to see this other side of life – the painful hurtful side to begin to appreciate how much God has done and continues to do for us in his Son, Jesus. You see the Bible is describing life as it really is, describing us as we really are. It’s an earthy, warts and all, kind of book that hides nothing about humanity’s wickedness and God's reaction to it. In fact, the Bible that is orderly, sweet, easy-going, talking only about lilies and birds of the air, full of joy and peace, would not be of much use to us; it wouldn't be our book. It wouldn't relate to what is happening in our world today, and in our lives right now. The Bible is about us - the people we are, rather than people we think or wish we are. And because the Bible is genuinely about us and our sin, the problems that all this has brought into our world including sickness and death, and God's judgement on sin; it has its ugly and terrifying side. As a preacher, I am tempted to try to protect you from the terrible texts of the Bible. or reassure you that God doesn’t worry about sin or will never hold anyone to account. 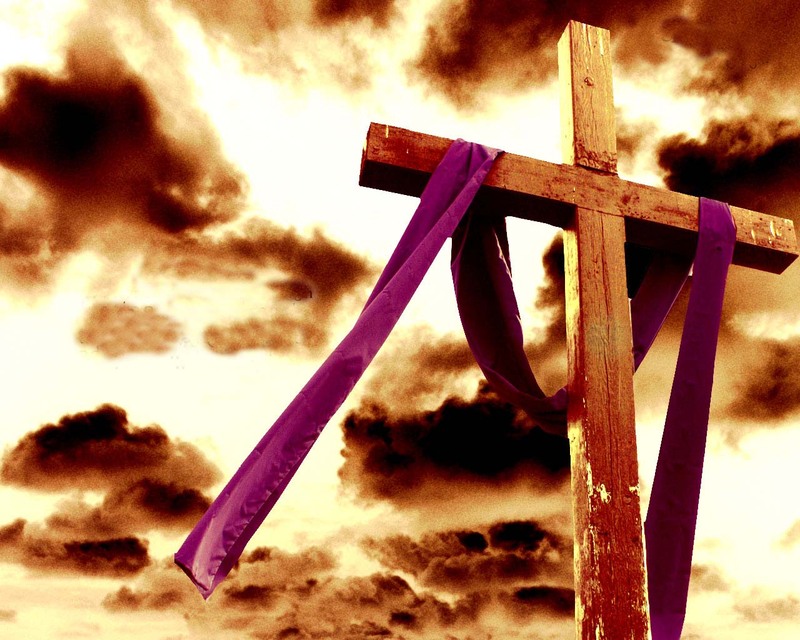 I could avoid talking about the horrifying events on Golgotha, even remove the cross from the front of the church in case it might offend you by reminding you of that terrible day and focus only on the resurrection. I could talk about Palm Sunday and focus only on the shouts of praise but there is terror lurking behind the scenes. This crowd will soon turn against Jesus in a bloody and violent frenzy crying out loudly and unanimously, "Crucify him! Crucify him!" In fact, if we are totally honest, we can see ourselves in the crowd; those voices are our voices, spoken in our language, with our accent. It's a terrifying moment when we realise that the voices that one moment are praising Jesus and in the next moment calling for his death are our voices. We are the ones who are so fickle when it comes to loyalty and commitment. We say we are followers of Jesus and yet when it gets too hard or uncomfortable it’s easy to say with Peter, “I don’t know this man”. We are the ones who become like Judas because things aren’t going the way we think they should. We are the ones for whom he endures the worst terrors of all so that we might be free from all that terrifies us. The Bible does have some terrible descriptions of what happens when sin gets out of control but it also tells us about the one who “humbled himself and became obedient to the point of death— even death on a cross”. Our God became involved in the terrors of this world. The Good News is that Jesus did not flinch from the murderous mob. He did not side-step the terror or call on a host of angels to protect him. He passed through the palm-waving crowd. He went into Jerusalem, and marched right on toward death, all the way to Calvary. God doesn't just talk about our fears, he does something about them. Even though the events of Good Friday are horrifying, God is present in them, working out our salvation for us. He takes all the terror we feel because of our failure and guilt and he dies there on The Place of the Skull. He says to each of us, “Brothers and sisters, I love you!" we turn to the one who underwent the ultimate terror – taking the sins of all people on his shoulders and experiencing God forsakenness on the cross. He knows what it means to be terrified and so he walks with us through our own fears. As the psalm says, “Even though I walk through the valley of the shadow of death, I will fear no evil for you are with me.” With Jesus going with us, we have nothing to fear. I don’t believe we can even begin to grasp what it really meant for God the Father and his Son to go through the horrors of Holy Week. For the all-powerful God to put himself in the hands of so much wickedness and to endure so much suffering is beyond our understanding but the thing we do know is this – Jesus went through the horror of Good Friday for us – to keep us safe from everything that terrifies us.